Luxury holidays in Florida promise a wealth of different worlds to discover, from the enchanted kingdoms at the world famous theme parks, to Caribbean and Latin American quarters, to natural wetlands and sun-kissed beaches. Along with an array of superb 5 star hotels in Florida, you’ll find a multitude of experiences all within one peninsula. With such an abundance of stunning natural scenery on offer, it’s easy to see why Florida has long been a popular holiday destination. Whether you’re relaxing on golden sands listening to the lapping seas or cruising through a mangrove swamp spotting unique wildlife, there’s plenty of fantastic sights and experiences on offer. Outside of the cities and towns, many of Florida’s natural environments remain untouched by developments, offering a range of pristine landscapes where you can shake off the stresses and strains of modern life. If you’re looking for a beach break in the sun, you’ve come to the right place. Florida’s coastline stretches over 1,200 miles and there’s plenty of places to surf and take part in watersports, particularly on the Atlantic coast. For calmer waters, head to the Gulf Coast. The climate is slightly warmer here and it’s a popular place for family getaways. For something more upbeat, seek out the bustling street scenes and vibrant nightlife in South Beach and Key West. If you’re travelling with little ones or you simply want to unleash your inner child for the day, delve into the fantastical world of Walt Disney and enjoy the thrills and spills of the theme parks in Orlando. Aside from the theme parks and beaches, Florida has plenty to offer on the cultural side of things. The state is a melting pot of cultures and includes many European and Latin America influences in its cuisine and architecture. Miami is the cultural capital, with its historic districts, concert halls, museums and artistic hubs. Florida is also well known for its range of wildlife. 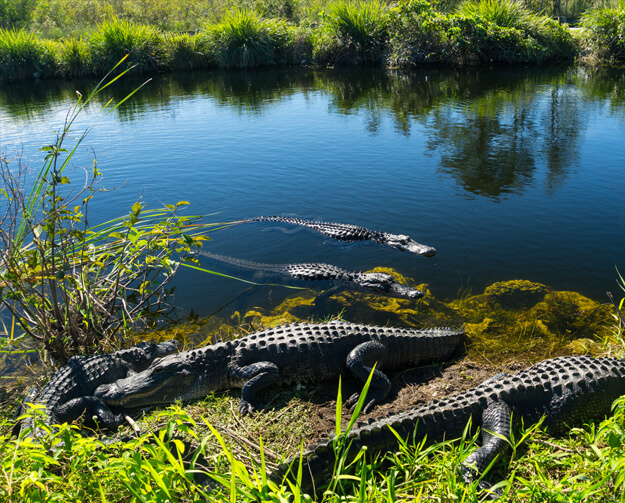 In the Everglades National Park, you’ll have the chance to see herons delicately striding through the water and alligators lurking in the undergrowth. In the winter, manatees migrate to Florida’s coasts and freshwater springs, while sea turtles can be seen nesting here in the warmer months. Nature-lovers will also be able to see tarpon and dolphins, swooping eagles and osprey. Kayak through semi-tropical waters or head underwater with a snorkel to get up close to manatees and loggerheads and swim next to colourful coral reefs. At Azure, we can deliver a unbeatable holiday that will leave you with lasting memories. We offer an amazing selection of luxury hotels in Florida which offer visitors phenomenal customer service and easy access to the main attractions and sights. Wherever you choose to stay, you’re guaranteed to have an unforgettable experience. To find out more about our Florida holidays, simply contact our friendly team by phone or live chat. Our expert advisors are ready and waiting to help you create a holiday package to suit your every need.